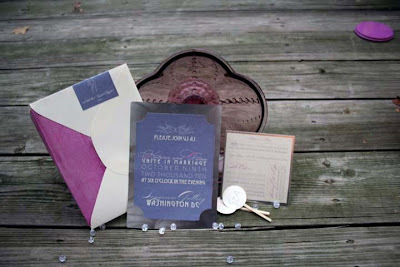 Urban Vows: These are a Few of My Favorite Things! When I like something, I really like it and the term "dog with a bone" comes to mind. I don't let things go easily and I don't forget about something when it's peaked my interest. I have been like that my whole life. I see a coat in a window display that I fancy, I dream about it, draw about it and when someone's talking to me I imagine "they'd look so much better talking to me right now if they were wearing that magnificent jacket". So with that said, here are a few of my favorite things! Rainbows from Confetti on Vimeo. Not a joke, I have watched Confetti Film's "Rainbow's" video a few too many times, I could probably rehearse the vows. I adore the couple, perfect style, perfect venue and the talent behind the camera is undeniably the best I have seen. It is stunning, I kind of can't handle it. 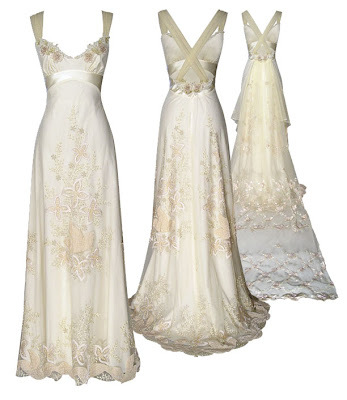 Claire Pettibone - her dresses are so unique, so intricate and beautiful. The first time I saw her "Kristene" dress I felt the need to do a thousand squats to ensure my behind will look good in that hot little number. Did you notice the train? It's in the shape of a heart, lovely! 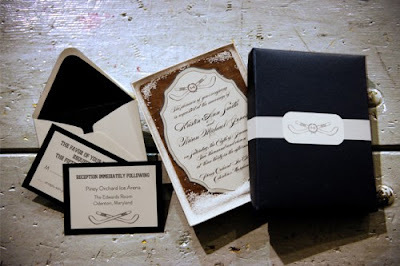 3)My favorite stationary: This one was hard - as couples get more and more creative, I am seeing lots of superb, out-of-the-box wedding stationary suites handcrafted by themselves. 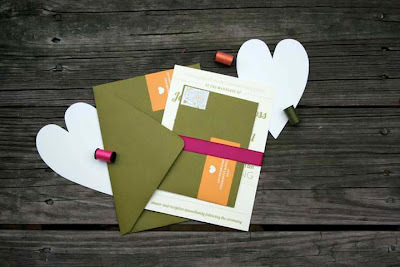 If you're not one to craft, I adore the Little Bit of Heart website for vintage and whimsical stationary. 4) My favorite hair? Oh this is a TOUGH one. First of all, I am a hair girl, my hair looks different almost every day so I don't really have a signature look. I do naturally gravitate towards pictures of blonde, messier styles, as that's what I would see myself in. 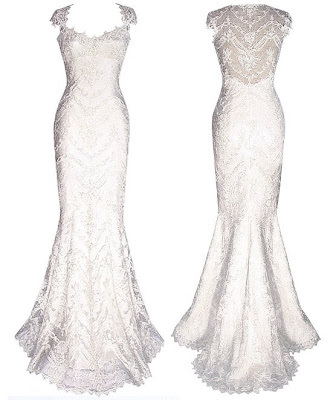 Now, this one was featured on a fellow wedding site the other day and I fell in love with it. 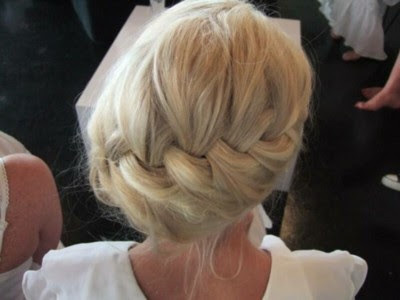 I do often sport a braid in my hair somewhere, but had never thought of just doing this one big magical braid across the back. So pretty! And this would work with all sorts of hair colours, types as well as accessories and veils. 5) Favorite bridesmaid dresses: Okay, I am cheating, just a little bit. I cannot pick just one from this site, so I am going to pick a line of bridesmaid dresses that I would shriek from happiness to be able to wear. BHLDN is Anthropologie's new bridal line and it is gorgeous! Unique, vintage, and definitely wearable again, your girls won't mind being in one of these! AGREED!! Kristene is exquisite!! Chantilly is beautiful also but I think Kristene wins out with the lacework and that heart shaped train. I never got the opportunity to shop for wedding dresses (we lived so far up north it literally took two days to get out of town!!) so I made my wedding dress. I still feel like I missed out on a ritual of shopping fun!! 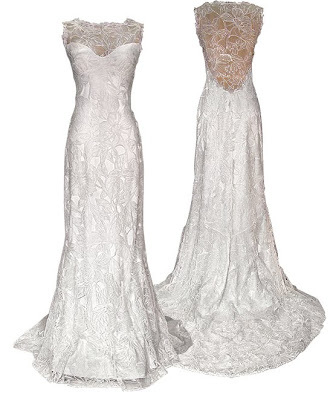 Those wedding gowns are GOR-GEOUS!!! 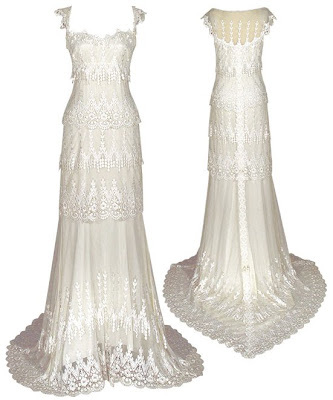 Hi Carole...there's always vow renewals ;-) I dream about Kristene - it's the most beautiful dress I have ever seen...I even know a shop in Calgary that has it! Where is my ring! ?